Wine Tasting at Monterey County Wineries – Find tasting room information including hours, information about wines served and tasting room amenities. 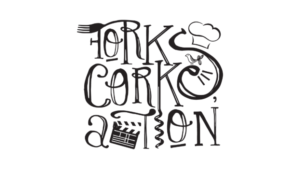 Vote for your favorite Monterey and Carmel area wineries today! Where are your favorite places for wine tasting? If you’ve ever taken a trip up and down California's coastline, then you've probably experienced its near magical knack for making you feel as if you've been transported to a faraway locale reminiscent of an old European seaside town with rocky crags and weathered Cypress trees. 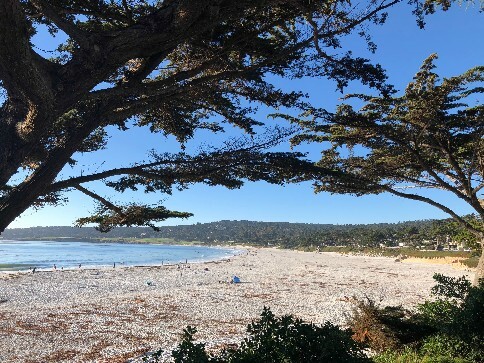 The small town of Carmel-by-the-Sea, and its neighbor Carmel Valley, which is located about 12 miles inland from the ocean, are both excellent choices to visit for a weekend of wine tasting, relaxing and touring. Carmel-by-the-sea which is more commonly called Carmel is known for its quaint Cotswold-inspired shops dotting the streets and excellent views of the Pacific. Carmel Valley, whose green, rolling hills hug up against the surrounding Santa Lucia mountains, could be an illustrator's model if old fairy tales had taken place on the west coast. Whether you're seeking a weekend getaway with friends or a soothing respite from city life, Carmel offers something for every type of traveler. Below is our guide to 48 hours to Wine Tasting in Carmel, covering what to eat, what to sip, and where to walk it all off. Start your morning by meandering your way through downtown Carmel, which runs up to the edge of the beach. Carmel's “downtown” is far from what you'd typically call a downtown in a city; their street signs are carved from old wood and there are no parking meters in sight. Whether you're staying in the area or have driven in from neighboring Monterey, you can ditch the car once you've arrived as the entire village spans a mere one-square-mile. 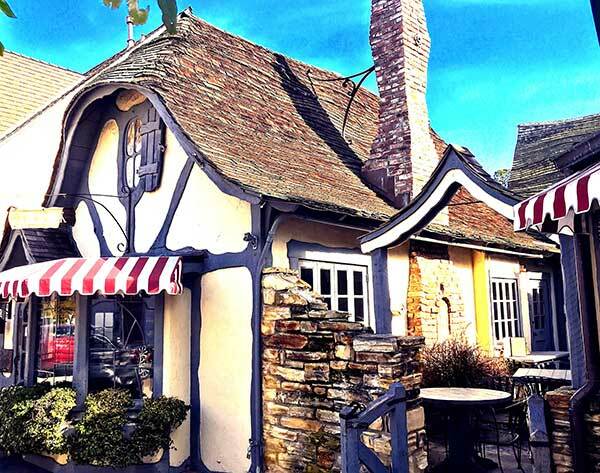 Enjoy Carmel's variety of boutiques and mom & pop shops before making your way over to Tuck Box, a charming cafe that resembles a little hobbit house or tiny English cottage. We recommend that you try one of their famous homemade Tuck Box scones, and don't skip out on the cream! Keep in mind that Tuck Box is cash only, so you might stop by an ATM on your way over. The Tuck Box on Dolores St.
Tuck Box draws pretty large crowds in the mornings for good reason, so if you want to opt for something with less of a wait, take the 3 minute walk down Dolores street to arrive at The Little Swiss Cafe, a tiny breakfast & lunch nook that still feels like a locals-only haunt. Be sure to try one of their Swiss sausages or cheese blintzes, which they make in-house daily and serve with preserves and sour cream. It's still a little early for wine tasting, so we suggest that you take Ocean Avenue, which sits only a block away from The Little Swiss, and walk down to the beach. Here, the faded, rocky coastline forms a beautiful cove marked with California cypress trees, which have bent into gorgeous, almost Dr. Seuss-like shapes from winds that have blown through from the Pacific. Take any of the staircases down to the beach, a dog-friendly stretch of sand that allows all pups to be off-leash so they can run around and enjoy the sites too. If you're not in the mood to walk in the sand, you might take the breathtaking walk down Scenic Road, the street that runs alongside the ocean. Here you'll find an excellent walking trail with open views of the sea from start to finish. Architecture lovers will get to see some truly astounding homes including one of which was designed by the famous architect, Frank Lloyd Wright. If you haven't gotten your fill of Carmel's beaches yet, head down to Carmel River State Beach, a 1-mile protected beach with a lagoon formed where the Carmel River empties into the ocean. This lagoon regularly attracts a large number of migratory birds, and the area has become a sort of protected sanctuary for birds flying through. If you're in Carmel during the fall or winter seasons, this is your best chance for unique bird watching. Head back into town where it's by now sure to be bustling. If you've worked up a thirst and an appetite, Carmel offers boundless options for lunch. Stop by 5th Avenue Deli for an array of hot and cold sandwiches (the Tuna Salad is a favorite) or, if you're keen to stay on the move, opt for one of their to-go lunch boxes, which feature an assortment of sandwiches, chips, sides, and a cookie, and are perfect to bring along for a sunny picnic outside. If you are ready for wine tasting (we hope you are! ), take a break at Scratch Wines, a trendy tasting room stationed in an art gallery between Ocean and 7th Ave. Sabrine Rodeme, Scratch's impossibly cool winemaker, makes a beautiful Grenache that is easy to sip while taking in the gallery's art. 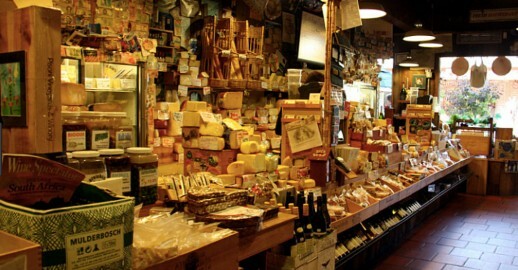 You can't start your wine tasting adventure in Carmel without making a trip to the beloved Cheese Shop, which carries over 300 types of cheeses from around the world, a small but refined selection of gourmet foods, and a lineup of stellar wines from all over, with an emphasis on wines local to the Carmel region. Top off your wine tasting afternoon with a trip to Silvestri Vineyards Tasting Room, where its owner, the famed Composer Alan Silvestri who wrote the theme music for Forrest Gump, Back to the Future and The Avengers is serving up some of the most drinkable wines in Carmel. In recent years, as Carmel has gained notoriety as a top eating and wine drinking destination, new restaurants have cropped up that rival some of the most loved places in bigger wine-centric areas like Napa and Sonoma. We recommend that you make reservations at La Bicyclette, a cozy French bistro serving European Country cuisine using fresh ingredients from around the area. The food is a charming nod to Carmel's European flair, and an appreciation for the area's ability to produce some of the freshest and tastiest produce around. If you're leaning towards Italian fare, you can't go wrong with Cantinetta Luca, where their salumi is aged on-site in a glass room in the back of the restaurant. The food is as authentic Italian as it gets, with wood-fired pizzas and homemade pastas that highlight the menu. Spring for the Burrata as an appetizer, and do not skip out on one of their tasty salumi selections, which is paired with a homemade Ciabatta loaf and Salsa Rustica on the side. Satisfy your sweet tooth at the end of the evening at Cottage of Sweets, an old school candy shop that's been operating in Carmel since 1959. Shelves are lined with a variety of novelty and nostalgia-filled candy brands, and don't leave without hitting the counter for a sampling of their homemade fudge. If Carmel-by-the-sea is a cozy and compact foggy village, then Carmel Valley is its clear, consistently-sunny and expansive cousin. 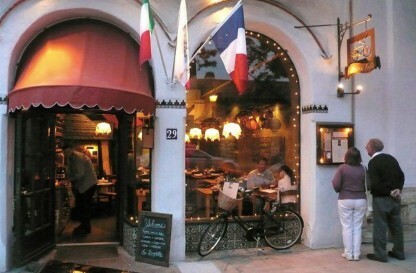 Carmel Valley is situated 12 miles inland from Carmel-by-the-Sea via a short drive down Carmel Valley Road. Though it's only a short drive away, the terrain feels worlds away from its quiet oceanside counterpart. Luckily, most everything you'll want to see and do here sits right along Carmel Valley Road! We recommend kicking off your day in the valley by making a stop at Jeffrey's Grill for breakfast. Jeffrey's has been whipping up breakfasts made with local ingredients for 24 years now. A staple in the area, Jeffrey's is known for their bananas foster french toast. If you're craving something more savory, you can't go wrong with the Eggs Benedict. We prefer the “Not-So-Classic”, which comes with smoked salmon and dill hollandaise sauce. If you're the outdoorsy type, you'll find that there's no lack of lush hiking trails to journey through while you're visiting Carmel Valley. Make your way to Garland Ranch Regional Park to explore this 3500 acre forest, which runs from the banks of the Carmel River up to the northern edge of the Santa Lucia Mountains. The trails range in difficulty, but if you're aiming for a more enjoyable stroll, go for the Lupine Loop, which spans only 1.5 miles. 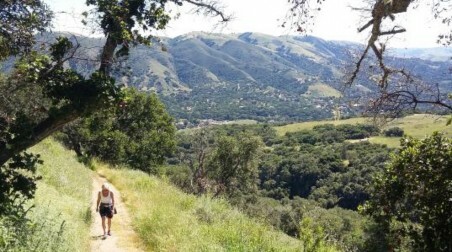 If Carmel's plethora of eating and drinking outposts have you feeling a little full, try the more strenuous Sky Trail up to Sinively's Ridge, which runs 5.4 miles and boasts more than 1,700 feet of elevation gain during the hike. You can't spend a day in Carmel Valley without visiting Earthbound Farms Organic Farm Stand & Market. If the name sounds strangely familiar, it's because it's the same Earthbound Farms brand you've probably seen in your local grocery store. Though it's now a produce powerhouse, the company began back in the 1980s as a small family-run raspberry farm. In addition to fresh smoothies and various sandwiches, the market cafe also offers a fantastic build-your-own salad bar. Have a seat at one of the outdoor tables to soak up some sun and the surrounding view, and after wrapping up lunch, take a walk through the mini garden and honey bee habitat. As most of the wineries in Carmel Valley are located in rugged and remote locations, the Valley focuses its attention toward tasting rooms more than actual vineyards. There are roughly 37 tasting rooms in the area, so you won't be hard-pressed to find a decent glass around town. Taking the fairy-tale surroundings to a whole new level is the newcomer Folktale Winery & Vineyard, which inhabits the former Chateau Julien Wine Estate. Enjoy a glass of chardonnay in the sun room, or head to the patio for a game of giant Jenga. Folktale moves away from the rich, deep flavors sometimes associated with the area, and instead produces wine of more bright and acidic varieties. Another mainstay for wine tasting in Carmel Valley is Boekenoogen Winery, which has been family owned and operated since its start in 1998. John Boekenoogen transformed the family's fifth generation cattle ranch into a vineyard that focuses on growing grapes which consist of Pinot Noir and Chardonnay. Make sure to taste his Syrah, which grows exceptionally well in the region due to its occasionally cooler climates. 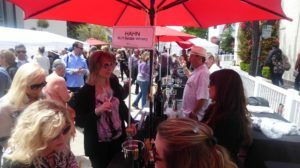 If you'd prefer your wine tasting rooms stay in close proximity to one another, look no further than Carmel Valley Village, a one block strip that features many of the areas most popular tasting rooms. Windy Oaks Estate, and Parsonage Winery Tasting Room sit near one another, and both consistently deliver beautifully open and innovative wines. 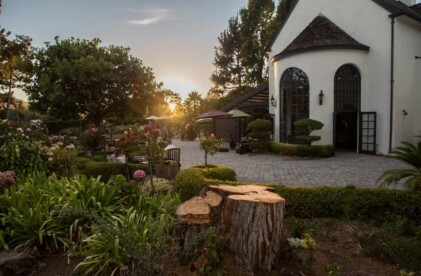 To tie off your wine tasting weekend in swanky, Carmel fashion, head up to Bernardus Lodge's Lucia Restaurant & Bar, where head chef Cal Stamenov pushes a menu inspired by farm-to-table dining, with many of his ingredients sourced right on the lodge's property. While classic California cuisine is emphasized on this menu, his locally-minded approach gives his plates an intriguing twist. Other equally incredible dining experiences include Valley Kitchen at Carmel Valley Ranch, and Roux, a thoroughly French restaurant with accents of Spanish provisions helmed by Chef Fabrice Roux. If you have the time, detox from the day's activities before turning down for bed at Refuge Spa, where you'll be encouraged to participate in the “Thermal Refuge Cycle”, a repeated exercise of cold to hot baths followed by the sauna and steam room, and finally – the part you've been waiting for after two days in Carmel – a well-deserved retreat to their relaxation room.